Released to coincide with the very day that marked the official birth of King Crimson back in 1969, Live At The Orpheum is a document of the first, and hopefully not the only tour undertaken by the 8th live incarnation of the true founders of what became known as progressive rock. Back on the 13th January 1969, down there in that west London cellar, a music was discovered that only an entity called King Crimson could play, and 46 years on that remains the case with this latest remarkable, somewhat unexpected and most probably final reunion. Duly pre-ordered and now arrived, I have waited three days since this latest package from Burning Shed landed on my doormat to play it, because the only proper way to listen to music as mighty as that made by any and all versions of King Crimson is on the hi-fi at neighbour rattling levels. Annoying the neighbours is one thing, but I have far more sense than to upset the delicate sonic sensibilities of my better half, who will, without compunction, bestow the epithet “racket” on most of what I choose to listen to, bless her. She’s probably right in a lot cases I must admit! The three days waiting until she ventured south to visit family passed agonisingly, but I was not going to spoil it by listening to this album through an inferior computer soundcard, or worse on a mobile device via earbuds, no siree! I tried not looking at it for a whole day…and then…looking at it. Ultimately the discipline was worth it, as Live At The Orpheum is a sonic treat, and doubtless sounds different than one might imagine, for how do you envisage a three-drummer frontline in your mind’s ear if you happen to be living the wrong side of The Pond and have not seen it in action? The album starts with the customary walk-on, this time ending with the run-off snippet from the Islands LP where Fripp counts in the string section. Weirdly, and possibly disconcertingly for the musicians it is in a completely different meter to eventual start of One More Red Nightmare, the song that commences proceedings. The first thing to note is how the dynamics have shifted from the long-running Adrian Belew line ups. The one and so far only time I have witnessed King Crimson in action, way back in the year 2000, the band was not so much as heard as felt. The Belew-led monster vibrated your very core, and that gig on 3rd July 2000 at Shepherd’s Bush Empire in London remains one of if not the most visceral live experience I have ever had the pleasure to see, hear, and most definitely feel. 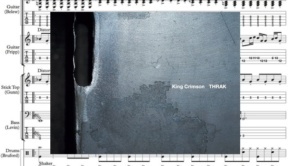 King Crimson Mk8 tone down the gut-churning menace a touch, and surprisingly given the amount of rhythmic heft in this line up, come across as a more subtle construKct. Not to say that there is not power to be heard and felt, for there most definitely is, but the mix gives the impression of a slightly less physical experience. 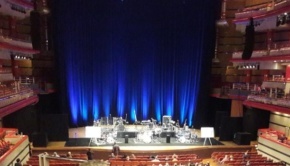 I have read from folk who were there that the three drummers are, as we look at the stage, Mastelotto/Rieflin/Harrison, and presumably that’s how it transmits through the speakers. This has the effect of making Bill Rieflin’s contributions a tad hard to spot, unless you’re a drummer, when no doubt it is obvious who is hitting what. A small gripe, but personally I would have preferred a video rather than a high-resolution stereo mix on the DVD, just so we can see what goes down. 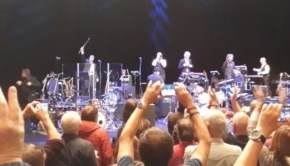 Given Fripp’s well documented retirement in the wake of his incessant royalty battles with record companies rendering his music-making gene dormant, this reunion was as unexpected as it was welcome. The reunion came about partly because of the final and successful resolution of that particular war, enabling Fripp to re-engage with his muse, and also partly as a consequence of the rather good and sadly largely ignored Scarcity Of Miracles “project that became a ProjeKct”. That album came from sessions between Fripp and Jakko Jakszyk, later augmented by Mel Collins, Tony Levin and Gavin Harrison. For King Crimson MK8, those five are joined by Bill Rieflin, who has a Fripp connection from the incendiary Rieflin/ Fripp/Gunn power trio and their excellent Repercussions Of Angelic Behaviour album, and Crimson stalwart and Ricky Tomlinson lookalike Pat Mastelotto (you’ll probably have to Google that if you’re not from the UK! Who said you can’t have a sense of humour and be a King Crimson nut?!). 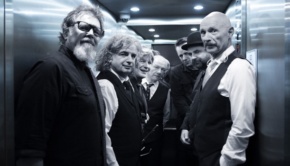 You need to be a particularly powerful musical personality to be the bass player in front of three drummers, and they don’t get much more commanding than Tony Levin, who seems to be more in demand than ever these days. His thunderous bass or trusty Stick is never far from causing seismic shift, but the power is always masterfully controlled. 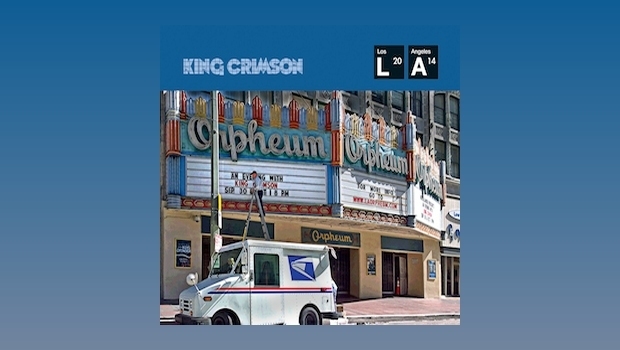 These tracks are taken from two nights at the Los Angeles Orpheum, towards the end of King Crimson’s 20-date USA tour of autumn 2014. As you can see from the setlists at the end of this page, music spanning four decades was given the Crimson treatment and a well-chosen selection features on this album. One criticism I have seen made is that this album is too short, and in defence I would say that given the speed that this has come out, and the no doubt hundreds of hours of recorded material from the tour to sift through, Live At The Orpheum if it was to be given the full-on production treatment it deserves is as much as we can expect given the time constraints. Of course, knowing Fripp’s appetite for gargantuan and exhaustive documentation of all matters Crim, once this incarnation of the band is laid to rest I am sure we can expect a massive box set, and hopefully before that some new material, given that Fripp now appears to be enjoying his professional life at last! For now I am happy to be happy with what we have been offered from on high. Back to the music on the album, and not before time, I hear you think; with Gavin Harrison acting as a kind of drummer’s foreman, arranging a lot of the music, this seven-strong unit is effectively two groups working as one. The drummers fire off one-another with a controlled precision that quickly lays to rest any fears of flailing six-armed cacophony, while the back line of the two guitarists and Mel Collins’ reeds add the colour. In the middle is the solid rock that is Tony Levin, holding it all together with his irrefutable and instantly recognisable low hertz glue. It is good to hear Mel Collins back in the mix, and taking on Ian McDonald’s parts on opener One More Red Nightmare one is drawn to his highly melodic style, adding warmth and humanity to the edgy maelstrom. That organic feel is nowhere more in evidence than on ConstruKction Of Light, a tune that previously was a crystalline exercise in guitar math-rock precision, here given another dimension by Collins’ flute playing. Given the unstable and constantly shifting nature of the various line ups of Crimson, some of whom never played live begs the question, is this actually “Mk8”? Who knows, but this all has the consequence that there are songs in the Crim canon that previous to this tour had never or very rarely been played live before, and sensibly a few of them are included here. The Letters, from 1971’s Islands is one of them, and that was the sole studio album with Collins as a full-time member rather than a hired hand. For many years the only live evidence of that band was the poorly recorded Earthbound LP, but now we get to hear Mel Collins playing two of the songs from Islands in full sonic glory. The Letters and Sailor’s Tale which follows it benefit from Jakko’s vocals which are uncannily similar in tone to Boz Burrell’s, and so fit perfectly. Somehow, you can’t really envisage Adrian Belew singing these numbers. It is well documented that prior to Islands a certain Geordie by the name of Bryan Ferry auditioned for the role of singer, but Fripp wanted a singing bass player. It is a shame that for whatever reason Fripp chose to teach Burrell the bass guitar rather than Ferry – just imagine what a Crimson version of The Bogus Man would have sounded like! After a brief gamelan percussive interlude The Letters, Pete Sinfield’s everyday tale of lust and suicide reprises Mel Collins’ dirty baritone sax, and is very close to the original. Sailor’s Tale is probably a definitive version, some forty two years after the event, with a much more defined guitar sound given an extra edge by having two guitarists, and of course Collins playing along in synchronous harmony. The thing fair rattles along, the three-drummers-as-one never getting in each other’s way, and of course TLev’s rubberband bass playing is the final piece in this jigsaw of tight ensemble playing. Then Fripp flies out the window with that wonderfully odd atonal blast of notes before the group come crashing back in, a hundred tons of justified and ancient metamorphic rock’n’rolling stones. Marvellous! Starless is one of those rare things – an utterly timeless piece of intelligent song writing topped off with some truly spellbinding improvisational derring-do. To call it “prog” is to confine its majesty to an undeserved genre straitjacket. No, this is simply just musical brilliance writ large. The song section is probably familiar to all of you, and I’ll bet a few of us have sung along to it in the shower. Jakko does a good take on Wetton’s vocal role, his higher register adding fragility to an already emotive but simultaneously powerful construct. Then THAT bass line kicks in and slowly, slowly, catchee monkey….you all know what happens next. Percussive additions in the mix (possibly Pat – it has his “traps and buttons” feel to it) rattle and pop quietly as one of the guitarists slowly ascends the stairs to the manic denouement as the other plank gets royally spanked, chunky power chords in tandem with TLev’s thunderous bass pin you to your seat. Mel Collins enters on sax as the tune careens off down the highway. Yep, this is a darn good version, and the hopeful prospect of new music from this great band is quite mouth-watering. It’s only halfway through January, but I see no reason why this tantalising taster of an album should not end up in my 2015 top ten come December.